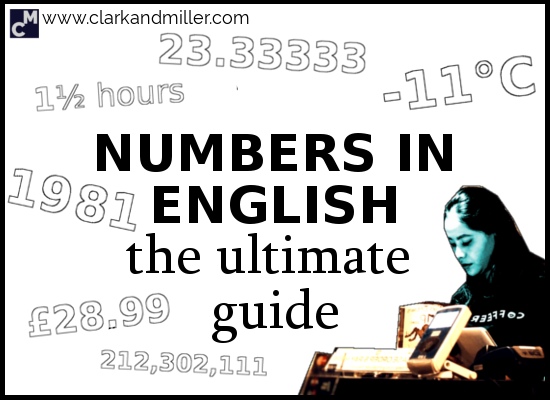 This is the ultimate guide to numbers in English. Also check out Maths Vocabulary in English: Do You Know the Basics? Saying numbers in English can be tricky. In fact, some of the most advanced learners make mistakes saying numbers in English. A lot. But it’s important to get them right, right? We need numbers all the time. We need numbers when we talk about money or how long that really boring film was or or what the temperature is or the size of your new elephant factory. So let’s make you an expert in saying numbers in English! OK. Take a look at these sentences and see if you can say the numbers correctly. Don’t move on to the next part until you’ve tried to say them. It’s like a test — but a fun one! There were about 120,000 people at the gig. It was massive! We produce 342,876,288 cans of elephant food every year. I can’t leave until I’ve beaten Kat’s score of 12,073. I’m going to be here all night. Well, let’s see if you were right. OK. There are four things you should think about here. 1. Break big numbers up into pieces! Note: To avoid confusion between commas (,) and full stops (.) in big numbers, there’s an international standard. What’s the solution? Just uses spaces. 2. Don’t make “one hundred,” “one thousand,” etc., plural! Did you notice the “and”? Basically, every time we say “hundred,” we say “and” next. But it’s worth remembering that most English speakers don’t add “and” — it’s usually just the Brits. So you can ignore this rule if you like. OK. Look at these sentences. How do you say them? That one only costs $1.89! Let’s get it! They really wanted to sell the house for £200,000, but in the end, they had to accept half that. Wow — €0.99? That’s cheap! In the first example ($1.89), did you notice how we said the first number first (1), then the currency ($), then the other number (89)? Remember, we don’t have to say “cents” (or “pence” or “Kopek,” etc.). It’s clear from the context. If you’re talking about big numbers all the time, it doesn’t make sense saying a long word like “thousand” again and again. OK — can you say these times correctly? Be careful here. I’ve written these all in 24-hour time, but we don’t say all of them in 24-hour time. Think about the context! The film about sushi starts at 19:00. Don’t be late! The plane leaves at 17:43. Then the adventure begins! The next train leaving platform 4 will depart at 15:00. Shall we meet at around 18:30? Most of the rules here are a bit different because they depend on context. So when we’re hanging out with our friends (like in the first and fourth examples), we almost never use 24-hour time. And when you do use 24-hour time, never use “o’clock” or “half past” or “5 to” or any of the normal “telling the time” stuff. We just say the numbers. That means we don’t say “nineteen o’clock.” Ever. Just never say it! Instead, we just use 12-hour time. So don’t say “nineteen o’clock.” Instead, say “seven o’clock.” Thinking of saying “five past twenty”? Don’t! Say “five past eight” instead. And my answer is always the same: If you like, you can say “p.m.” or “a.m.” to clarify. But how many people go to the cinema at 7 in the morning? Usually, the context is clear enough. When we’re talking about a train or a plane or a bus leaving, we can use 24-hour time, and it doesn’t sound too weird, even when we’re talking to friends (like in the second example). And we can certainly expect to hear it when it’s being announced at an airport or station (like in the third example). “It’s half 6.” (half + number) — this one’s a bit informal, and it will confuse Germans. Remember, we only use “o’clock” when the time is on the hour (“two o’clock,” “four o’clock,” “one o’clock,” etc.) and no other situation! OK. You may be wondering what a “decimal” is. Yes, we must angle the mirror at precisely 45.665° to destroy the ships and rule the world! After the point, we just say the numbers one by one (“six six five”). Maths is weird, and I find it strange that stuff like this can happen with numbers. But when you have the number 6 repeating itself forever, I’d recommend not saying the number again and again until you die of thirst or boredom and all your friends have left the room. Shall we move the meeting to the 3rd? He came in 1st. Again! The man’s a machine! You are currently 256th in the queue. Your call is important to us. Please hold. There are a few very simple rules here. Because ordinal numbers are very specific (How many first places are there in a race?) we almost always use “the” before them. Make it an automatic habit! You don’t have to use “the” if you have a possessive. The third horse on the left is looking at me strangely. May I introduce you to my seventh wife? Generally speaking, to create an ordinal number, you just add “-th.” (Although sometimes the spelling can be tricky.) Click here for the full list of ordinal numbers. This is the fifth computer he’s bought this year. You’re the ninety-ninth person to ask me that today. It’s the first Sunday of the month — and you know what that means! It’s the fifty-second week of the year. Finally! OK. You know the drill. How do you say these sentences? The meeting should’ve just been 1 ½ hours, but because Eduardo wouldn’t stop talking, it went on for over 2 ½ hours. I was late for my tennis team meeting. I don’t want all of it — can you just give me ⅙ of the pizza? No, make it 2⁄6 … That’s ⅓, isn’t it? Remember the ordinal numbers we talked about above? We use them for fractions, too. There are two numbers — “1” on the top and “3” on the bottom. Remember that if we’re dealing with a fraction that doesn’t have “1” on the top, the ordinal must be plural. Take the number on the top as usual (“2”) and make the ordinal on the bottom plural, so “third” becomes “thirds” (because in this case, there are two of them). 4. Get the order right with fractions! The usual way to say these numbers is as you read them. Say “two and a half” then “hours” (not “two hours and a half”). 4. With 1 ½, there’s an alternative! Did you notice that in the example above, we said “one and half hours,” not “one and a half hour”? This is a rule in English that a lot of books don’t talk about much. But here I am … talking about it! I guess the logic is that if the number is anything more than one (including 1.000000001), it’s officially plural. OK. Can you say these correctly? In the middle of winter, it reached -40°C. My hair started freezing. But then, in spring, it could get up to 1°C. I have no idea whether 12°F is hot or cold. So when it’s that cold and your hair is freezing, then it’s probably below zero, right? Remember, you don’t need to say “Celsius” or “Fahrenheit” if it’s clear from the context. In fact, you don’t even need to say “degrees” if it’s obvious you’re talking about the temperature. Also remember: when you use the third option (with “below”), you don’t need to say “zero” or “degrees,” but only do this when it’s clear whether you’re discussing Celsius or Fahrenheit. And make sure that it’s clear that you’re talking about the temperature and not your downstairs neighbours. 2. Celsius or centigrade or Fahrenheit? OK. This is pretty simple. Celsius and centigrade are exactly the same. So don’t worry about mixing these ones up. Because it’s impossible! “Fahrenheit” is the weird measurement that the Americans use that I just don’t understand. To me, Celsius makes sense: 0°C is where water freezes and 100°C is where it boils. Not the space with aliens and frightening amounts of radiation. And Sandra Bullock acting badly (as usual). I mean the space of a room or a box or a cave. Yeah, we had to downsize. The new office is only 30m2. And there are 15 of us! Watch this amazing man fit into a box that’s just 30cm3! This is pretty simple. You have a choice here. You can say “12 metres squared” (number + “metres” + “squared”). Or you can go for “12 square metres” (number + “square” + “metres”). You can say “3 metres cubed” (number + “metres” + “cubed”). Or you can say “3 cubic metres” (number + “cubic” + “metres”). That’s it! Nothing else to see here. Please move on. Talking about speed in English! No, not the Sandra Bullock film. Please stop talking about Sandra Bullock. OK. Remember to say these before reading on. We don’t have enough road to get up to 88 mph. This bike is capable of getting up to 45 km/h. Seriously. The speed of light? It’s almost 300,000 km/sec. 1. “Per hour” or “an hour”? When we’re talking about speed, we have a choice — we can say “per hour” or “an hour” (or “per second” or “a second”). But which one to use? “Per hour” sounds a little more technical and formal. But the difference is small here, so I wouldn’t worry about this too much. There are better things to worry about. Like global warming. It’s important to remember that the distances here are very likely to be plural (unless we’re talking about 1mph or 1km/sec). The great fire of London? That was 1666, I think. My gran was one of the oldest people in my town when she died. She was born in 1905. Seriously! Her husband was born in 1900! What did you do for New Year’s 2000? I’ve been thinking about changing jobs since 2003. But I’m still here. Maybe next year. They thought the world was going to end in 2012. But they also thought that the world was flat and that lizards are our rulers. I can’t wait for 2020 and a new decade. This last one was a bit rubbish! OK. There’s a lot here. But the good news? It’s all pretty simple. When the year ends with zero plus a number (e.g. 1903, 1109, 1601) just say “oh” instead of the zero (“nineteen oh-three,” “eleven oh-nine,” “sixteen oh-one”). Remember, this only works for years after 1000 and not years beginning with 20 (e.g. 2009). If the year ends in double zero (e.g. 1400, 1100, 2100) just say “hundred” after the first numbers (“fourteen hundred,” “eleven hundred,” “twenty-one hundred”). Remember, this doesn’t work for triple zero years (e.g. 1000, 2000, 3000). With these, we just say “thousand” (“one thousand,” “two thousand,” “three thousand”). For some reason, when the year 2000 came, we decided to just forget all the rules we made for the years. But what about after that? What happens after 2010? Apparently, no one can agree on this. So we hear people saying “twenty eleven” and other people saying “two thousand and eleven.” Those people have more energy. “But that’s mad! Does this continue forever?” I can hear you asking. OK! You’ve made it to the end! Congratulations! You rule! You are now a MASTER of saying numbers in English! But you’ll need to do one more thing to really take in what you’ve learned today. Look at these numbers — can you write them out in full? Did you find this useful? Do you know any people (or koalas) that might also benefit from this? Then BE AWESOME AND SHARE! Spread the knowledge! 1. One hundred and eighty eight million, one hundred and ninety eight thousand, twenty three kilometers squared. 4. Thirteen point thirteen recurrent. 5. Four kilometers and a half. 6. Fifteen degrees below zero (Celsius, centigrade). 7. Forty-five miles per (an) hour. 8. Two thousand and one. 1. — This is perfect, especially for American English. If you want, you can also add “and” to that last bit (“..and twenty-three kilometers squared.”) But you don’t have to! 4. — As far as I know (and I’ve had a good check on the internet), we don’t use “recurrent” in numbers like this. Use “recurring” instead. 5. — Sorry! Check again! (the section called “saying fractions in English.” Good luck! 7. — Yeah, yeah yeah! Great work Phil and well done for giving this a go! I watched an old episode of QI last night. It’s the sort of thing I do when I’m waiting for another programme to start. It included the vital piece of information that, if you wrote all the numbers down in alphabetical order, the first odd number would be eight billion and eighty-five. Thanks for such a great piece of info, Si. What about a number 160? should it be one hundred AND sixty or and is redundant? I think it’s going to be redundant in the future, which means you can choose which one to use! I have a question about the years ! Are the Fifties, the Sixties etc. only used for the 20th century? Or Is it possible to say the Thirties in the 19th century (referring to a particular event or series of events in History)? That’s a really good question, Emma. I’ve seen “the 60s” used for the 1860s. I think as long as the context is clear, then you can use them for any century. Thank you very much, Clark. So many doubt checked and answered. Great post. Hello, Gabriel! Thank you for a wonderful blog! But I haven’t found the information about “nought”, and I also have doubts about reading numbers like 0.035 – shall we say “nought point oh three five “? Good question and thanks for pointing out that this is missing in the post. With these decimal numbers, I usually go for “zero” as it helps keep things clear. So, 0.035 would be “zero point zero three five.” However, it would also be fine to use “nought” and “oh” as you did. It is useful for both, teachers and students. Wow, very comprehensive collection here. Do you think there’s any space left to add something about how Americans talk about time?